8906-1 Features: -Blade material: High carbon stainless steel. 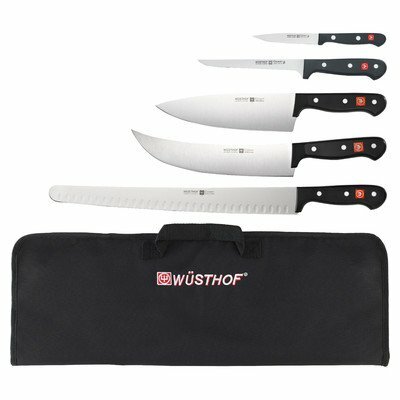 -Set includes utility knife, boning knife, wide cooks knife, brisket slicer, hollow edge, 6 pocket knife roll and blade guard for the brisket knife. -Gourmet collection. Blade Material: -High carbon stainless steel. Handle Material: -Metal. Number of Items Included: -7. Pieces Included: -Boning knife/Carving knife/Chef's knife/Utility knife. Dimensions: -Set includes 4" Utility Knife, 6" Boning Knife, 8" Extra Wide Cook's Knife, 9" Cimeter, 14" Brisket Slicer, Blade Guard for Brisket Slicer, and 6-Pocket BBQ Knife Roll.. Overall Product Weight: -3.07 lbs.